Veteran robot builder, Zak Hassanein, teamed up with Obtainium Works to compete in the Battlebots TV show on the Discovery Networks (Discovery & Science Channel). Sparks flying, robots dying, all coming to your TV screens starting May 11th at 8:00pm on Discovery, and May 16th at 9:00pm on Science Channel. See Sydney Crump, Shannon and Kathy O'Hare, along with photographer Stephen Jacobson, Angie the dog, and our "Deus Ex Machina" robot carrier join the adventure! More photos to come when we are allowed to show them by the BattleBots TV Show! The Deviled Egg Battlebot. Decorations by Shannon O'Hare. Creator of the Deviled Egg Battlebot. The Steamy bot carries the Deviled Egg into the Battlebot fighting Arena, causing much bewilderment. Built by the Obtainium Works Crew. 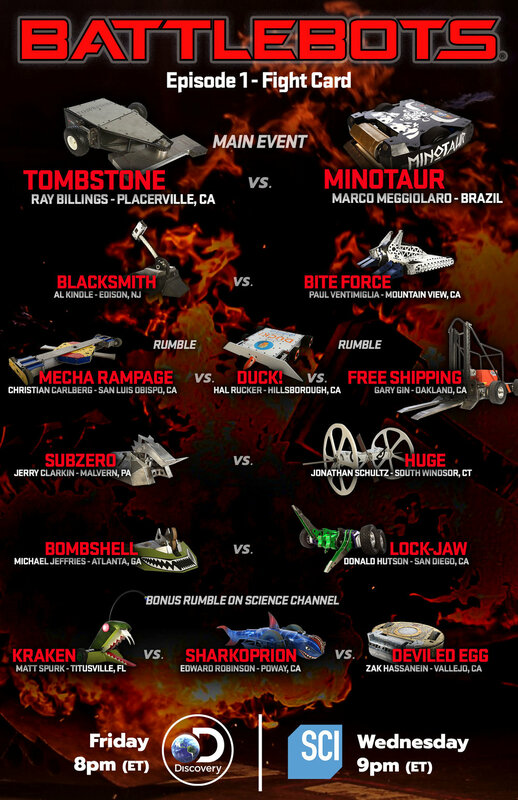 Here is a collection of all the Battlebots robots for 2018. Shannon O'Hare mounting the Deviled Egg Battle Bot onto the Steamy carrier bot. Shannon and Kathy O'Hare prepping the Steamy carrier bot.